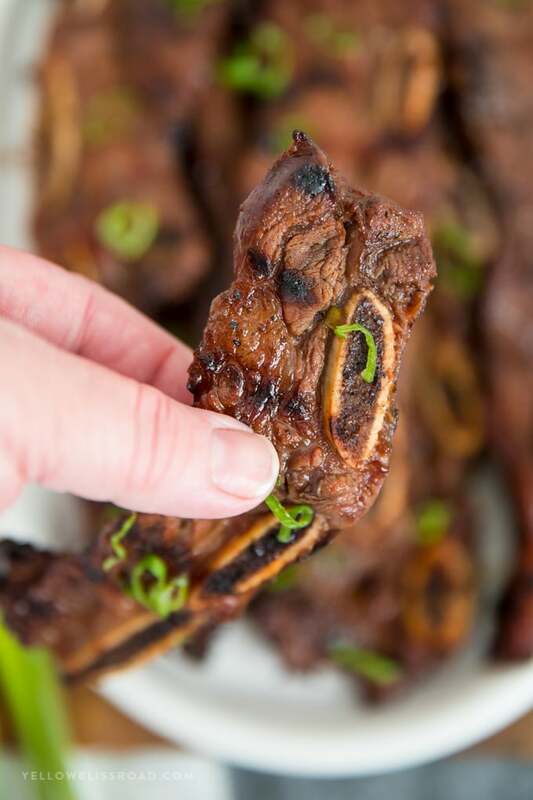 These delicious Grilled Korean Short Ribs are so tender and full of flavor! 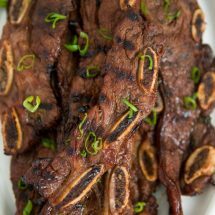 Marinated in a tangy Kalbi style marinade for hours, this juicy short rib recipe is sure to become an instant favorite! When I was in high school, my mom was our church secretary. Or church rented space to a Korean congregation that would use the facility after our church services were over, and they always held a meal following their services, and that almost always meant Korean Short Ribs. Occasionally the high school groups would still be on campus, and we always could smell this mouth-watering aroma coming from the kitchen. Once in a while they would invite us to join them. Oh, that was heaven! They took pride in the food they prepared and there was a lot of it. Korean Barbecue, rice, vegetables were just a few of the items available. It was incredible. My mom secured their Korean short ribs marinade recipe long ago and has been making it ever since. 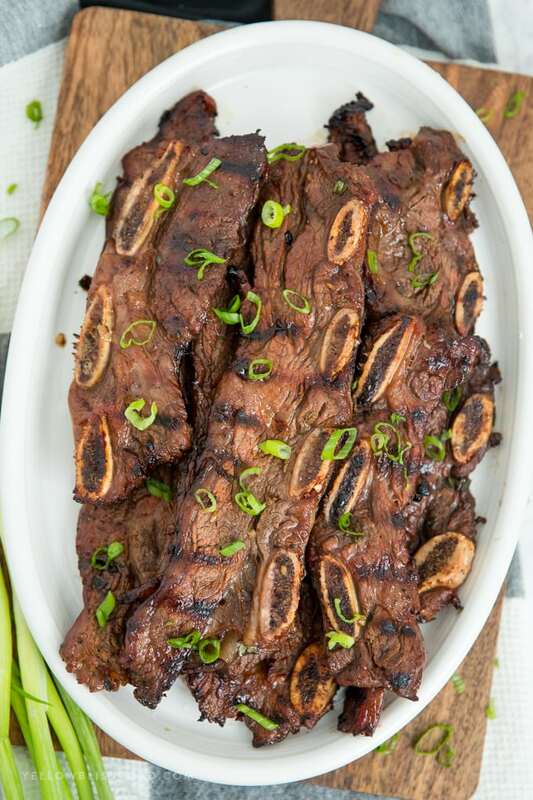 The key to these Korean Short Ribs (aff) is the cut. English style cut shorts ribs are cut between the bone, so each piece has a thick bone with a good size chunk of meat attached. For Flanken style ribs, the ribs are cut lengthwise and across the bone, to create a thin piece of flank steak with several thin, oval shaped bones throughout. You may need to ask your butcher for this cut if it isn’t readily available in the meat section of your grocery store. The ribs are then marinating for several hours (the longer the better!) and grilled on your outdoor grill over medium heat for a few minutes per side. Because the meat is so thin, it’s important not to overcook these. Three minutes per side is usually perfect for a medium rare, but depending on the thickness of the meat and the heat of your grill, you may need to play around with this. 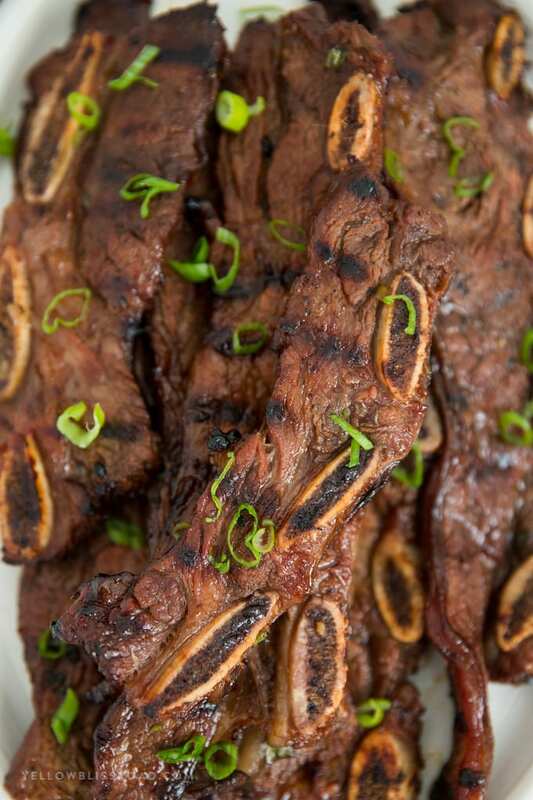 What is Korean BBQ Marinade? 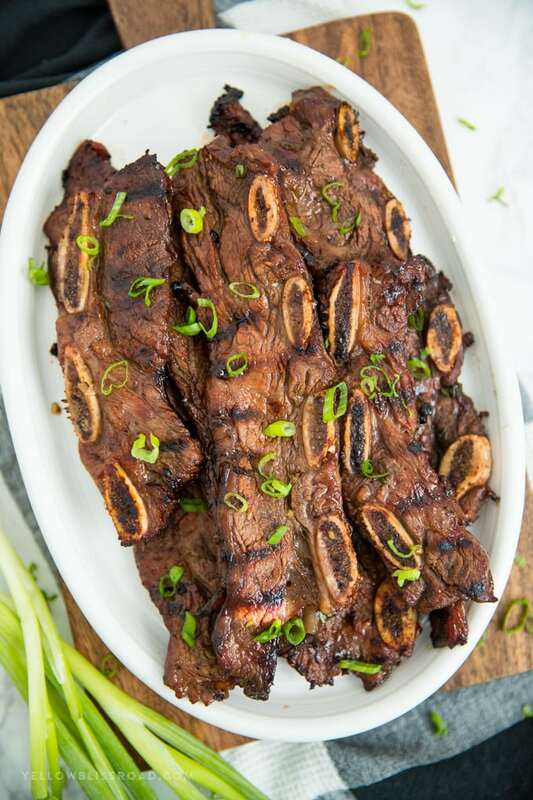 How long do you grill Korean Short Ribs? To get a tender piece of meat, you’ll need to marinate the ribs in this mixture for at least 3 hours, but the longer the better. We usually leave them in the fridge overnight. Then throw them on your outdoor grill heated to about 400 degrees (medium) for about 3 minutes per side. Just like with any meat, place it on the grill, then leave it alone until it’s ready to flip. Remove them from the grill and tent with a large piece of foil to allow them to rest, them serve while they’re still hot. We love these Korean Short Ribs with classic barbecue sides like Grilled Corn, Macaroni Salad and Grilled Zucchini. In a large zip lock bag, combine together the soy sauce, brown sugar, water, garlic, green onions and sesame oil to dissolve sugar. Add ribs, squeeze out all the air and refrigerate for 4 hours or overnight. Preheat outdoor grill for medium-high heat and lightly oil the grate. Remove the ribs and discard the marinade. Grill until meat is medium rare, about 3 minutes per side.